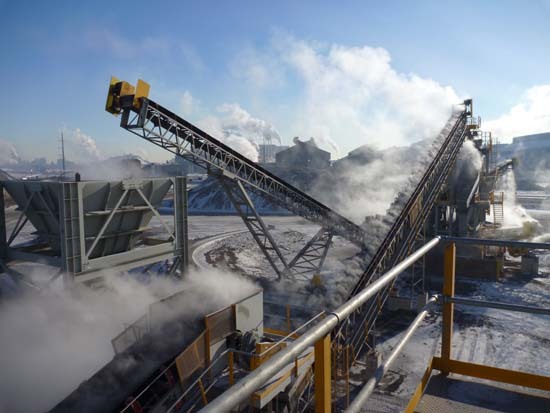 Custom polyurethane parts from Argonics are used in a variety of bulk material handling, mining, construction equipment, and conveyor product applications like skirting, replacement blades, and impact bars. Photo courtesy of Argonics. Although design engineers have traditionally specified parts made of rubber, plastic, or steel when durability is required, many are considering a new alternative for the most demanding, high-wear, abrasion and impact applications: cast polyurethanes. Cast polyurethanes, also broadly referred to as urethanes, are tough, elastic materials that combine many of the performance advantages of high-tech plastics, metals, and ceramics, along with the resiliency and flexibility of rubber parts. Unlike their closest counterpart, rubber, which is prepared as sheets or loaves before being molded in a high pressure press, urethanes can be poured as a liquid mixture into less expensive, low pressure molds. Using this technique, complex mold cavities can be filled without high-pressure molds and presses. In terms of performance, cast polyurethane parts are often lighter in weight than ceramics or metal alternatives, are not brittle, and will not crack like plastics under stress or extreme temperatures. To be sure, cast polyurethane parts are not new. Nonetheless, awareness of the potential for this type of material has largely remained under the radar. This can be attributed to several factors, not the least of which is a general lack of understanding of the options and formulations. Potato farming equipment manufacturer Double L Global uses Argonics's proprietary urethane, Kryptane, for a recently developed component designed to sweep product off a conveyor path. Photo courtesy of Argonics and Double L Global. One does not simply specify a polyurethane part, for example. There are many formulations– some proprietary– that can be used to manipulate a range of variables such as hardness, resilience, spring rate, and chemical resistance. For this reason, design engineers interested in a possible switch to polyurethane from plastics, steel, ceramic, or rubber parts are often best served by seeking out the assistance and guidance of experts in urethane formulation. When a Dutch ship builder required a new slipway liner that could absorb the impact and abrasion of a speedboat exiting and entering its offshore patrol vessel through a rear bay, for instance, it selected a specially formulated polyurethane from Argonics, one of the U.S.'s largest producers of wear-resistant urethane products, over other materials. The urethane liner replaced a nylon plastic liner, which tended to damage speedboats because it was too hard, according to Lars Muller, owner of Muller-Beltex, a Netherlands-based parts distributor to various industries, who was involved with the project. "The liner had to resist impact, abrasion, seawater, and UV exposure, yet allow the speedboat to slide in and out of the bay without damaging the speedboat or the patrol vessel," says Muller. 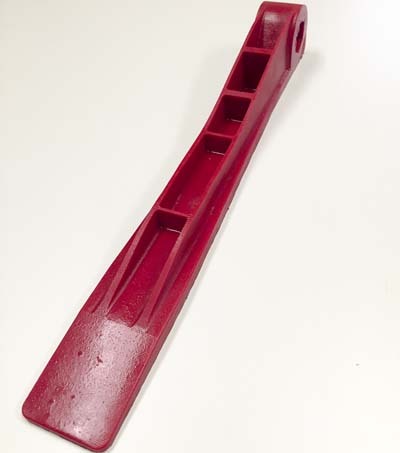 To maximize durability and cushion the impact of the speedboat entering and exiting the offshore patrol vessel's rear bay, Argonics collaborated with the Dutch shipbuilder and Muller-Beltex to engineer a urethane slipway liner composed of two layers of material, each with a different durometer, a measure of hardness. According to Muller, Argonics came up with the idea of creating a dual durometer liner to better withstand the inevitable wear and impact. "The urethane's harder top layer has more resistance against cutting and tearing, while the bottom layer is softer to better withstand the impact of the powerboats," says Muller. He adds that Argonics's expertise in urethane formulation helped to optimize the material for the necessary characteristics, while creating strongly bonded layers that would not separate. "With their expertise, along with CAD, SolidWorks, and prototyping capability, they can design a part in urethane to match any other substance or requirement," says Muller. Continued collaboration between the three companies has resulted in additional product refinements. "We recently beveled the slipway liner's edges to ensure that no seawater or sand can get behind it," says Muller. "We also hardened the urethane at the bolt holes to better hold the screws and attachments where they fit the liner. To ease installation in the field, we added countersunk areas in the liner to match the exact positions of the part's countersunk boreholes." "With urethane, you can combine strength, resilience, and lifetime durability in one product," adds Muller. "The end user is very enthusiastic about the slipway liner. The application is now fully accepted by the shipyard and a standard product in their ship line." Although urethane producers can create customized formulations to accommodate varying characteristics, such as hardness, resilience, and spring rate, some also have developed proprietary formulations. For instance, Double L Global, an Idaho-based manufacturer of potato farming equipment, relies on a proprietary performance-based polyurethane formulation from Argonics called Kryptane for components used to clean and sort potatoes. This includes gentle rollers, rotating cleaning stars, and rugged, load bearing parts. 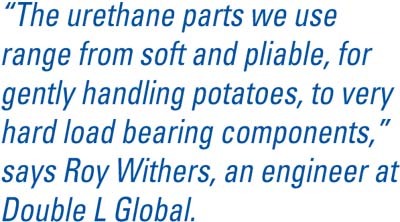 "The urethane parts we use range from soft and pliable, for gently handling potatoes, to very hard load bearing components," says Roy Withers, an engineer at Double L Global. Kryptane is an extremely wear-resistant material for applications where sliding, impact, abrasion, or corrosion occurs regularly. Examples include impact- and abrasion-resistant plates; blasting curtains and screens; chute, bin, and hopper liners; pipe, fitting, and valve liners; vibration pads, seals, and gaskets; as well as truck bed liners, wheel chocks, and crossover pads. According to Withers, Double L Global utilizes the proprietary urethane for a recently developed component designed to sweep product off a conveyor path. Previously, the component consisted of an integrated polyurethane paddle and a torsion spring. However, issues would often arise with the integrated paddle spring because the springs were inconsistently wound, causing the component to look aesthetically askew. The misalignment also often meant costly rework. To create a more aesthetic and streamlined part, Withers asked the company if the performance requirements of the torsion spring could be achieved by making the entire part from polyurethane. In order to achieve the desired spring performance, Withers felt the two design variables he could use were the cross sectional area of the part and the durometer of the urethane. Initially, Withers measured the metal spring's spring rate in an attempt to match performance requirements. He then developed a design with a specifically calculated cross-section. The company delivered four different polyurethane prototypes, with the calculated cross section and with different material durometers. Double L Global then physically tested the prototypes by seeing how much force it took to bend each, and how far it would deflect. After a few iterations, the correct durometer and cross section was identified and the urethane part went into production. "Argonics helped to improve the reliability and consistency of the sweep's design by integrating the spring into the urethane," said Withers. "Now, there is no metal spring– it's all one piece." Withers said that the sweep component is designed to be stiff enough to swipe potatoes off the conveyor, yet flexible enough to bend if it hits a hard object, like a rock. According to Withers, more economical tooling and the ability to fill even complex mold cavities can be particularly helpful to engineers during iterations of design, prototyping, and testing. "Instead of choosing to make parts via injection molding, I will often choose the method of poured urethane parts from Argonics because I do not want to pay the high cost of injection molded tooling," says Withers. "Urethane is usually much more cost effective for us, whether for one-off or higher volume parts." 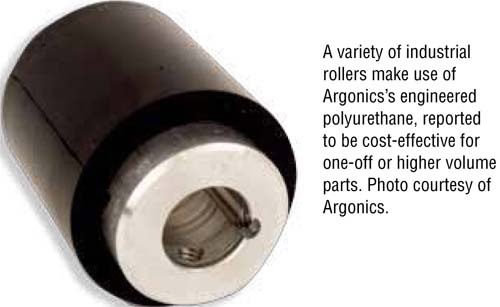 Argonics (www.Argonics.com) produces wear-resistant polyurethane parts at its production facilities in Gwinn, Michigan, and Louisville, Colorado.